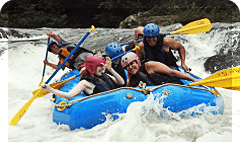 White Water river rafting close to Panama City is possible at the Chagres River which goes virtually unseen as it passes through the Chagres National Park due to the lack of accessible roads, protection against settlers, and the previous non-existence of Adventures Panama. This part of the river, characterized by currents alternating with backwaters, is considered as Class II, check Panama White Water Rafting Rapid Classification here, although several rapids are considered up to Class III by the International Classification of River Navigation. At the Panama Chagres River Map this section extend from Rio Piedras to the Embera Village. As a result of dense tropical forest covering the basin of the river, sedimentation is minimal; therefore, clear water can be expected very often. The flora is typical of the tropical rain forest, with more than three hundred species per hectarea. Although, it is the natural habitat of big mammals such as tapir and jaguar, tropical rainforest animals, they are very seldom encountered. However, It is much easier to spot several others samples of the fauna, such as rainforest monkeys (spider, howler, whiteface (cappuchino), Geoffrey's Tamarin), sloth, river otter, iguana, toucan, and plenty of fish. Once in the virgin jungle of Chagres National Park you will ask if this is the next tv show survivor panama destination. The Chagres Challenge Panama white water river rafting begins by picking up guests in Panama City at 5:00 A.M., to take them on a FWD vehicle to a remote village called San Cristobal, beyond the mountain town of Cerro Azul. After a light breakfast, around 8:00 A.M. the tour proceeds with a hike, for about hour and half, on a narrow trail that takes us deeper into the jungle until reaching an affluent of the Chagres, called Piedras River. We might have to continue hiking for another, hour or we might start rafting in Piedras River which is very shallow and most likely will require to get down to pass the raft in several spots. At approximately 11:00 A.M., we will start an exciting five-hour rafting tour in the Chagres virgin jungle, all the way to Madden Lake, reaching it around 4:30 P.M. We will have a fine meal somewhere along Chagres River. WHO CAN GO ? Any person from twelve to seventy years old, in good health and good physical shape, ready to walk for about an hour and a half through an irregular and muddy path. As a guidance limit weight values for persons to participate are as follows: up to 210 lbs, at least 6', up to 240lbs at least 6.5' . Minors must travel with a responsible adult. 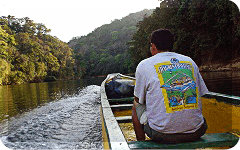 The Chagres River has enough water to do white water rafting in Panama year-round. It usually reaches its highest water level by November, at the peak end of the rainy season, and its lowest water level by May at the end of the dry season. However, the Chagres Challenge one day tour, can only be offered when Rio Piedras, the tributary we put in, has enough water to paddle, usually from June through February. When there is enough water we paddle San Cristobal River into Rio Piedras River into Chagres River, 3 river in one day ! Usually it is good to paddle in rafts from June through December. In January paddling is limited to smaller rafts. Usually from mid February until the date we close the season we restrain participation to people that knows how to paddle, are in very good shape, and preferable they had done it before. An helicopter flight from Albrook Airport to the heart of the Chagres National Park, our river put-in , to them continue rafting.